This blog was started two years ago when VK1OD.net was closed due to forced change of call sign. In that two years, more than 450 blog articles have been published here and there are more ‘in the wings’, around 10 articles ready for release as I write this. Though I set out to write mostly about electronics and less about Amateur Radio application of technology, that clearly hasn’t happened as the majority of articles are about Amateur Radio related technology. Interestingly, the most popular articles are about technology, but not about Amateur Radio technology. Amateur Radio has relegated itself to a backwater in electronics and technology hobbies. Relegated from the proud tradition that saw many of the significant contributions to electronics and communications technology from people who were also radio amateurs, and that had help shape their development. Amateur radio has transformed itself under the active guidance of its peak bodies into a contesting activity, train-spotting if you like and promoted as “radio sport” and the ‘original’ social network, a pursuit where technology is no longer the main shared interest (or much interest at all) and bad behaviour is rewarded. Progress! – diminishing interest in the underlying technology in amateur radio. There a many current projects that will give rise to blog articles, after all, the blog is my experimental notebook. Most current projects have some Amateur Radio element, but they apply wider current technologies to the experiments and are relevant not only to Amateur Radio but to radiocommunications more generally and general applications of technology to discovery. At Exploiting your antenna analyser #2, the matter of determining sign of reactance was mentioned. If you have an analyser that does not measure the sign of reactance, this information should be important to you. 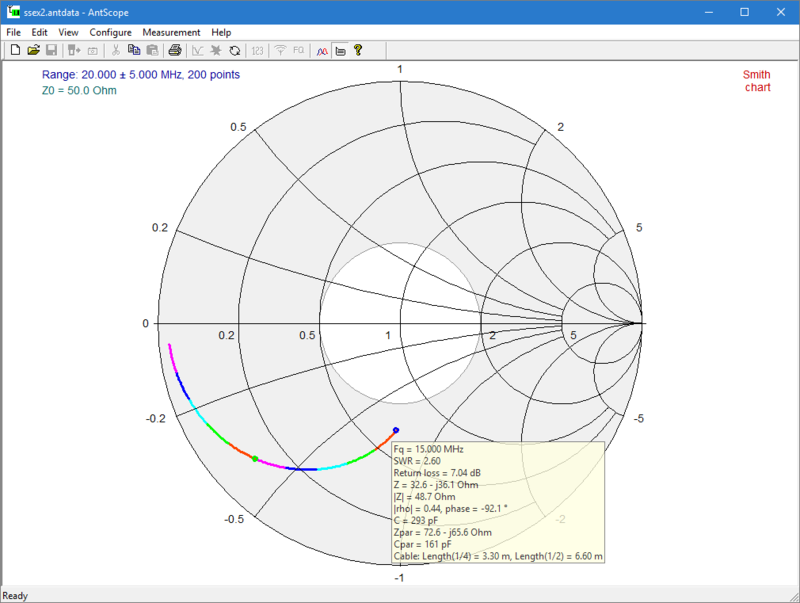 Above is a Smith chart plot of measurements from 15MHz to 25MHz. So having found that the length of the RG58 lines sections are both 1.98m (approximately 2m), let’s try to reconcile measurement and prediction of Zin at 9MHz. The examples discussed in this series of articles are designed for the test jig as described at Exploiting your antenna analyser #1 with a pair of nominally 2m length RG58 patch leads, a pair of 50Ω loads and some tee pieces and adapters to connect it all up. If you duplicate it, you will experience the same learning opportunities (the examples are structured). If you presume to redesign the experiment, your outcome will probably be different. Before you read on, take a measurement of Zin at 20MHz and write down the impedance value. Do whatever you do to determine the sign of the reactance. If your instrument displays the sign properly, use it, otherwise use the method in your user manual or whatever wisdom you trust. I often see posts in online fora by people struggling to make sense of measurements made with their antenna analyser. 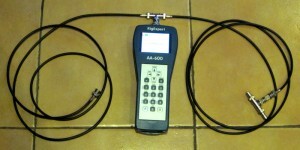 This article is about exploitation of a modern antenna analyser beyond its capability as a self excited VSWR meter. The latter is fine, and it is often not only all you need, but the best tool in optimising some antenna systems… but if you want to exploit the other capabilities of the instrument, read on. Great benefit can be obtained by measuring some known loads, and reconciling the measurement with the known. 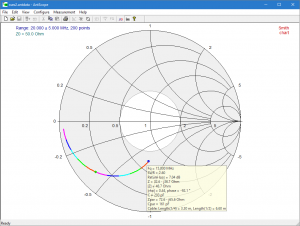 A quite simple set of equipment can be used to create a scenario rich with opportunity to prove your understanding of the basics of complex impedance, transmission lines, and measurement. Lets explore a simple example. I have recently installed the Threshold 2 update to Win 10, and apart from a number of small issues, it seriously broke my grabber environment on a 64 bit machine. Another of those threads has broken out on eHam illustrating that lots of hams do not understand the complex nature of impedance and cannot see the consequences of the formula to calculate VSWR from load impedance and transmission line characteristic impedance. I have successfully implemented a few projects on the STC 15F104E, a Chinese 8051 architecture MCU. The chip includes EEPROM, and some flexible extensions to the timers which potentially make it more useful than a standard 8051. I have previously observed that the documentation is poor, and the programming tool is poor. 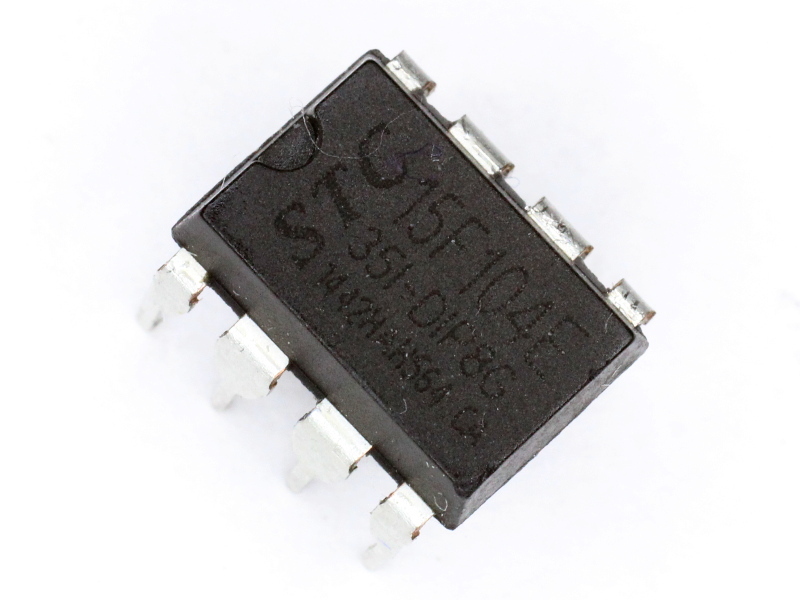 The project that led to the latest observations was an attempt to implement RC PWM – ON/OFF switch originally on one of these chips as it contained sufficient resources to suit the application. One of those resources was an +/- edge triggered INT0. This article describes an Aerial Under Test (AUT) that features in some of my experiments and write ups and is subject of some current experiments. It is a MobileOne M40-1 helically loaded vertical for 40m installed in the car roof. It is in the style of the popular US antenna, the Hamstick, but this is a little longer and the results are not directly applicable. 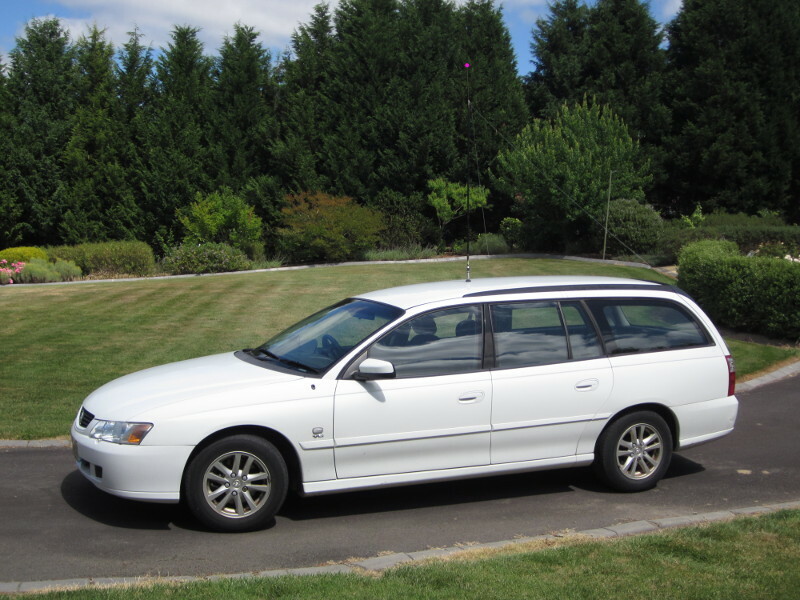 I hasten to add that this configuration is not suited to travelling, it is just a rather ideal mounting of a helically loaded whip without the questions that arise from the effects of roof racks, bumper mounts etc. The immediate application is for remote ON/OFF PTT or KEY of a transmitter for field strength testing at various locations. Remote control hobbies have long used a multi channel digital proportional protocol for control of planes etc. 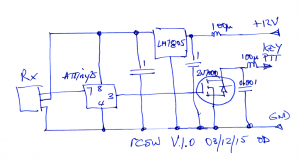 The simplest multi channel receiver has an independent PWM output for each servo. The PWM signal is a 1000-2000µs pulse with a repetition rate from about 50Hz up to 500Hz or so, the duration of the pulse conveys the information. The converter chip is a ATTiny25 MCU with firmware that monitors the PWM stream and provides ON/OFF and OFF/ON output pins. For the immediate application, the ON/OFF (or non inverted) output drives a 2N7000 FET with ‘open collector’ output suited to the PTT and KEY lines of most modern transceivers. The firmware ignores PWM signals with duration outside the range 900µs to 2100µs, and switches ON at 1600µs, and OFF at 1400µs to provide some hysteresis. 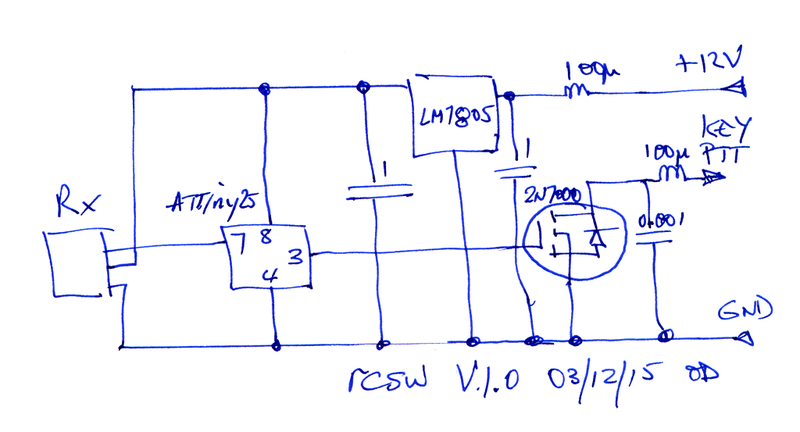 If PWM input is lost for 125ms, the output will fail safe OFF.